Barricade To Appear On Bumblebee: The Movie? Simba Smoby; a company manufacturing and distributing licensed diecast vehicles and RC cars based on the Transformers Franchise in Europe, is letting us know what the company is planning to offer in 2018. 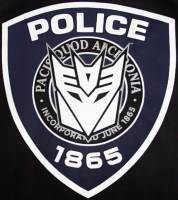 Based on the statement above, it seems as though Decepticon Barricade is a potential character appearing on the upcoming movie and may serve as the main antagonist since he is prominent enough to get his own toy. “Classic Buggy” may indicate that the Bumblebee RC car is in Volkswagen Beetle altmode. Simba Smoby will showcase the new toy line at London Toy Fair on 23rd January (Booth E135) and at Nuremberg Toy Fair on 31st January (Hall H – Stand B-02). Asian division of the company (Simba Toys) will have the same toys on display at their Kowloon, Hong Kong Showroom. More information can be found on our updated news post regarding the previous announcement. You can check out Simba’s current list of toys here. Stick with TFW2005 for more cool announcements, reveals and Fair Guides throughout this Toy Fair Season, leading up to our coverage of New York Toy Fair 2018. Insignia on the news post is for placeholder image purposes only. Barricade may or may not be a police car in the movie. All times are GMT -4. The time now is 4:07 AM.